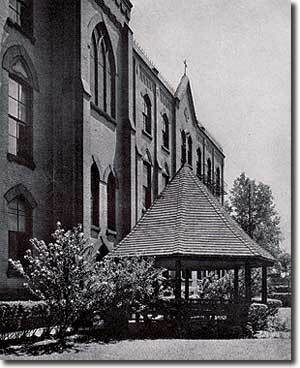 In 1858, two Franciscan brothers from Ireland came to Brooklyn and established what is today, St. Francis Preparatory School, making it the first private Catholic school on Long Island. For over 150 years, Prep has provided a community where young men and women grow in both their academic and spiritual lives. Come and experience this special place that embraces tradition and values...a place that regularly changes the lives of its students. 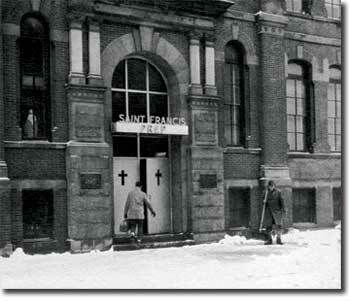 St. Francis Prep is a Catholic, college preparatory school in the Franciscan tradition. Our mission is to enable all students to develop and broaden their spiritual, intellectual, creative, emotional, social, and physical abilities. We value the unique contribution each person makes to the Prep community. We do not track students at St. Francis Prep. Students may be enrolled in one or several honor classes. From year to year, there is much movement into and out of honors classes. After freshman year, selection for honors classes is based solely on achievement in classes taken here. Such a system rewards your hard work and allows for a great deal of flexibility. St. Francis Prep is the largest Co-Educational Catholic High School in the nation, a school which celebrates the individual, and enables its students to grow in an environment filled with academic success, respect, integrity, and joy. St. Francis Prep is a family where each and every student is welcomed, a place where students are reminded of their unique value, and are encouraged and inspired to follow their passions. Our success can be seen by the Class of 2018 who earned over $166 million in merit based scholarships. There's nothing like the Saint Francis Prep family, a place our students, alumni, faculty, staff and parents all call home. We hope you'll consider making it your home, too. "High School is Four Years; the Prep is forever"
When can I see the school? All interested eighth grade students are welcome to spend a "Buddy Day” at St. Francis Preparatory School. Students should have permission from their grade schools to participate. Applications for Buddy Days may be found HERE. While we encourage all interested families to attend our annual Open House, individual Look-In tours may be scheduled. A Look-In Tour is an opportunity for students and their families to visit St. Francis Preparatory and make a personal connection. Learn more about the facilities, curriculum, activities, faculty and students. We encourage families to take advantage of this opportunity to get a first-hand look of our school community by registering HERE. SFP Town Hall Meetings where prospective students will have the opportunity to interact with SFP faculty and students in Q & A format. Register HERE. Information regarding admission programs can be found on the admission website. Information regarding athletic games, theater productions, and other school events can be found on the School Calendar. Please feel free to contact the Admissions’ Office if you have an interest to attend one of our events. Beginning Aug. 20, 2018, you may register 7 days a week online at www.tachsinfo.comor via telephone 1-866-618-2247. The best preparation is working hard in grammar school. Students should get a good night's sleep before the test and eat breakfast. Students must bring #2 pencils to their designated testing sites and their admissions ticket. St. Francis Prep offers a TACHS Prep Program; if you wish to register your child please do so at this link. Petersons, Barrons and Princeton Review all publish study guides for the TACHS and CHSEE Exams. Local bookstores and public libraries carry them. What criteria are used to select Saint Francis Preparatory School students? Catholic school students: Once you have submitted an application to take the T.A.C.H.S. test, the testing company will forward a 9th grade applicant record form to your 8th grade teacher. This application will contain information regarding your 6th, 7th, and 8th grade marks, conduct, and attendance. Public school students: Students must submit the applicant form to their current teacher and have it mailed to the Admissions Office at St. Francis Prep. If the form is not available, please submit copies of your 6th, 7th, and 8th grade report cards by Dec. 14, 2018. Nassau & Suffolk County students: If you have a similar form, submit it; otherwise, send copies of your 6th, 7th, and 8th grade report cards by December 14th, 2018. Saint Francis Preparatory School reviews not only 6th, 7th, and 8th grade scores but attendance, lateness, and conduct as well. Saint Francis Prep admits students without regard to race, color, and/or country of national origin. If I did not take the TACHS Exam, can I still apply to St. Francis Prep? When are notification letters mailed? Notification letters, acceptance, non-acceptance, or waitlist (if applicable), will be mailed Wednesday, January 20, 2019. Yes, we offer scholarships based on performance on the TACHS and CHSEE Exams, 6th, 7th, and 8th grade marks, as well as attendance, lateness and conduct. We also offer a need-based Tuition Assistance Program. All families are invited to apply. Applications are available through our finance office once a student is registered. Payment plans are also available with no interest or fees. Outside scholarship opportunities can be found HERE. 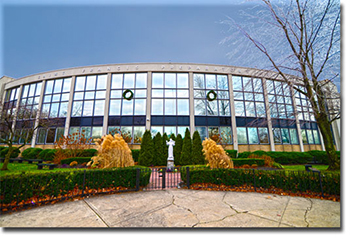 What courses are offered at Saint Francis Preparatory School? Saint Francis Prep offers the most extensive curriculum of any Catholic High School in New York. Graduation requirements and a full course listing can be found in our Curriculum and Course Planning Guide. How can I get into honors and AP classes my freshman year? For incoming freshmen we offer placement exams for math and foreign language each spring. In addition placement also depends on entrance exam scores, and/or state exams. St. Francis Prep encourages each individual student to pursue his/her talents by focusing on those advanced classes that they feel are suitable for them. St. Francis Prep does not track students; we encourage students to work up to their individual potential. Students are assessed each academic year for placement in advanced classes. What is the tuition at Saint Francis Preparatory School? The tuition for the 2018-2019 school year is $9,800. What is the dress code at Saint Francis Preparatory School? The dress code is listed under the General Rules page. What kind of athletic teams do you have? Saint Francis Prep offers over 45 interscholastic sports for both boys and girls. Check out our Athletics Page! What other ways can I get involved at Saint Francis Preparatory School? Saint Francis Preparatory School has over 60 co-curricular activities. Find out more on our Student Activities page!